Christoph's Chatbot book is a great way to enter the world of chatbots with PHP. It covers everything to get your first chatbot up and running and will leave you inspired to build your own. I'm glad that we partnered with Christoph on the Laracon EU chatbot. The chatbot is a fun and reliable way for our attendees to get information, plan their own schedule, and be kept up to date with current announcements. We think that it's great that the chatbot's development is chronicled in his book and that everyone can learn from that project. Next to the 200 pages ebook, you will get access to the video course showing how we built Laracon EU chatbot from the last chapter of the book. Benefit from my experience and let me teach you everything you need to know to build chatbots in PHP. When I started building chatbots in 2016 there wasn't a single tutorial available on how to do that with PHP. The only way of learning how to do so was by trial and error, but I made it through! Now, two years later, you will find some blog posts on the subject, but still not much. 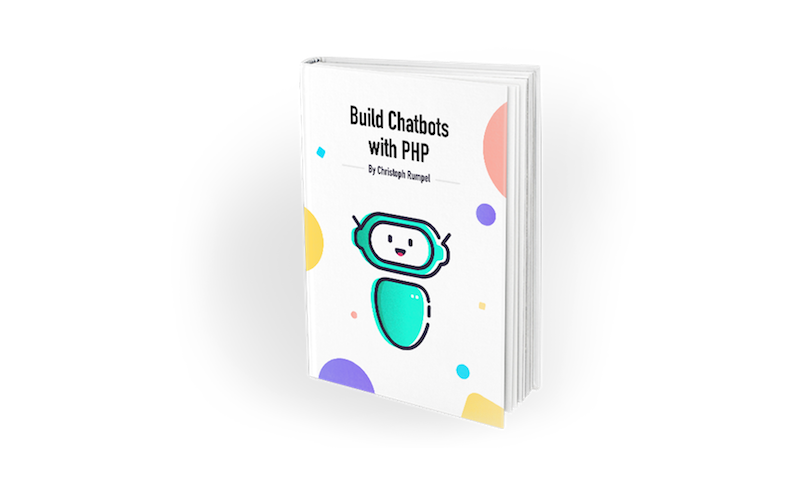 With this book, I want to change that and give everyone the perfect starting point for building chatbots with PHP. This package includes the ebook and the screencasts for creating the Laracon EU conference chatbot from the final chapter. Currently, not all of the videos are online. There will be more in the next weeks. I am a web and chatbot developer from Vienna. Welcome to my store. What the chatbot topic is about. Why it is important for the future. How chatbots could help your, your company and your clients. How to use PHP for building chatbots. How to use BotMan and Laravel to build the Laracon EU conference chatbot. How to use an NLP service like Dialogflow to analyze messages. Which ebook formats do I get? The main version of the book is a PDF. There is also an EPUB and MOBI version available, but the design is best with the PDF. Will there be more videos? All the planned videos are already available. There might be some more. €39? The other ebook I bought only cost €5. When you think about this you will notice that this project was not about making money :-) I could have done something else to get rich ;-) But what it was about providing value and share my experience in a new field. With this book you are able to create your own first chatbots for yourself, your company or a client. So I really do think it is worth the price. Can I get a customized invoice? After your purchase with Stripe or PayPal you automatically get an invoice. If you need something differently or specific for your company, use the provided contact details from the mail to contact me.